This game has great pace so far. Both teams looking to run at every chance. The Clippers are faster getting to the ball than the Thunder tonight, they're getting the loose balls. They are definitely playing as though this were a must-win. Looks like Griffin has twisted his left ankle on a foul by Ibaka. He's trying to walk it off, but doesn't look too comfortable.... Comfortable enough to make two free throws to make it 18-10, though. Blake still hasn't missed -- three-for-three from the field and two-for-two from the foul line. 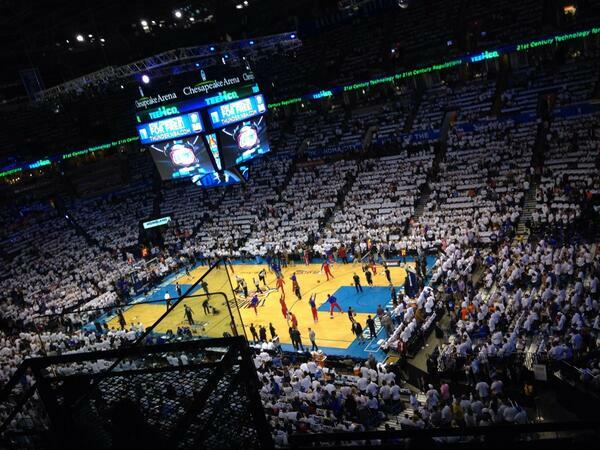 5:50 1Q: #Clippers 18, Thunder 10. @blakegriffin32 8 pts, 4 rebs. Clippers are up, 18-10, with 5:50 left in the first. Remember how the Clippers couldn't make a three-pointer to save their life in Game 4? They're 2-for-3 from that range so far tonight. Blake Griffin's been the man so far. He's three-for-three from the field and two-for-two from the line for 8 points. Clippes are shooting 55%, two for three on three pointers, and playing good defense. OKC is shooting 36%. When OKC goes to the line, you can hear a pin drop. The crowd goes dead silent! @melissa: Absolutely correct. But it's much more what Doc Rivers was hoping for than Game 4. And just look at Game 1 of the Memphis series two years ago to realize how meaningless early leads can be. Paul just split all defenders, makes shot. Next play, Blake Griffin is fouled as he goes up for an (attempted dunk turned layup?) He made the shot. Refs are reviewing whether it was a flagrant. 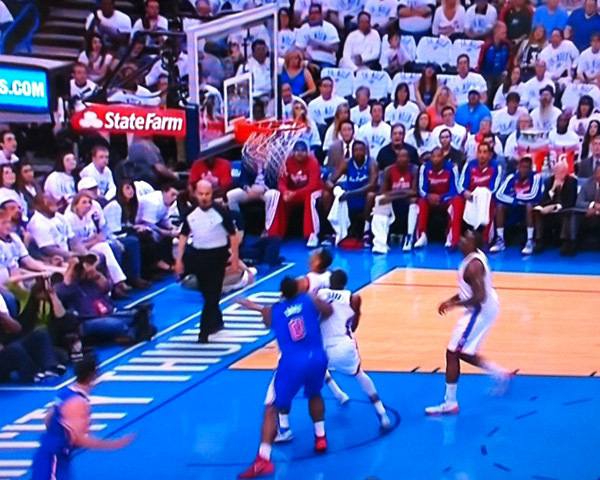 Westbrook may get tagged with flagrant on that play vs. Griffin - who scored. Griffin going to the hoop on a breakaway is something like a runaway truck heading down the Grapevine. Very tough to stop. Westbrook tried to wrap him up, Griffin scored anyway, and Westbrook is called for a flagrant foul. 22-12 with Griffin at the line. Refs determine that Russell Westbrook committed a flagrant 1 on Blake Griffin, which means possible three-point play plus possession. Griffin. hasn't. missed. a. free. throw. or. a. shot. Blake with 11 points. He's had 24 games, including Playoffs, with 10+ pts in 1st quarter this season. Griffin makes the free throw and the Clippers get the ball back. That could make it a five-point play ... But Griffin misses from 18 feet. The Clippers are on a 10-2 run with just under 5 minutes remaining in the first. 23-12, Clippers. @melissa. Of course, you realize as soon as you wrote Blake Griffin hadn't missed anything, he missed. Not that you're a hex or anything. Just saying. Big baby is making his shots too. The Clippers are looking goooooood right now. @mike: So if I say I'm going to win the lottery tomorrow, would that mean that I will. Just saying. Big Baby doesn't move very well, but he has a decent shot. Just doesn't get much space between the soles of his sneakers and the hardwood. The Thunder have 5 first quarter turnovers with 3:17 remaining. Redick again. And the Clippers are playing exceptional defense, forcing mistakes by OKC. A couple of wild turnovers on passes on the last two possessions. Griffin's got 11 points and five rebounds in less than nine minutes. Clippers are being patient and have a lot of ball movement. They're playing with so much confidence. Redick with a floater, and he's got 10 points. Clippers are passing the ball as if they get penalized for holding on to it for more than half a second. Great movement. Reddick has 10 points in just under 10 minutes. A Collison-Collison collision. Foul goes on Nick. 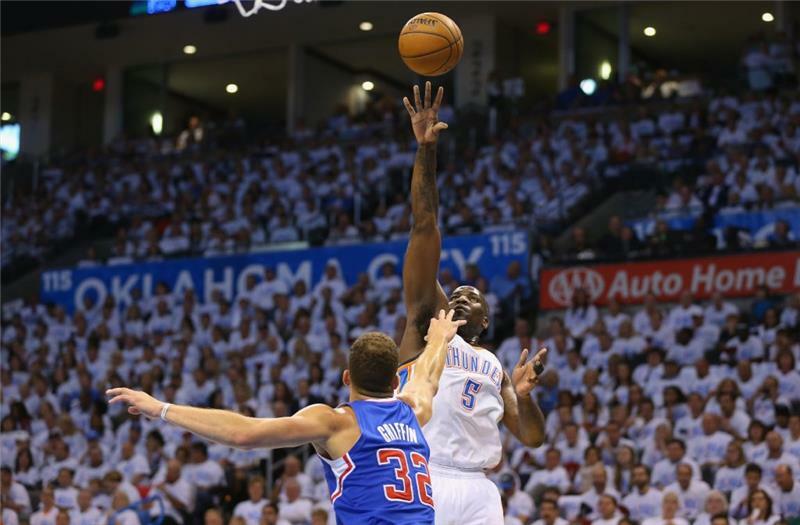 Thunder's Kendrick Perkins takes a shot against Blake Griffin, first quarter Game 5. Just had a Brad Turner sighting. Very exciting. Reggie Jackson is one of those streak shooters who can cause some damage. He makes only one of two free throws to cut the lead to 10, 31-21. Durant was so tight-lipped after Game 4. He was mad. It'll be interesting to see what he does tonight. So far he has 4 points on 1-for-4 shooting.